Location: The bridge spans the canal 0.25km south of bridge No 94 and reached by a lane from B 4269. Tow-path to the east side. 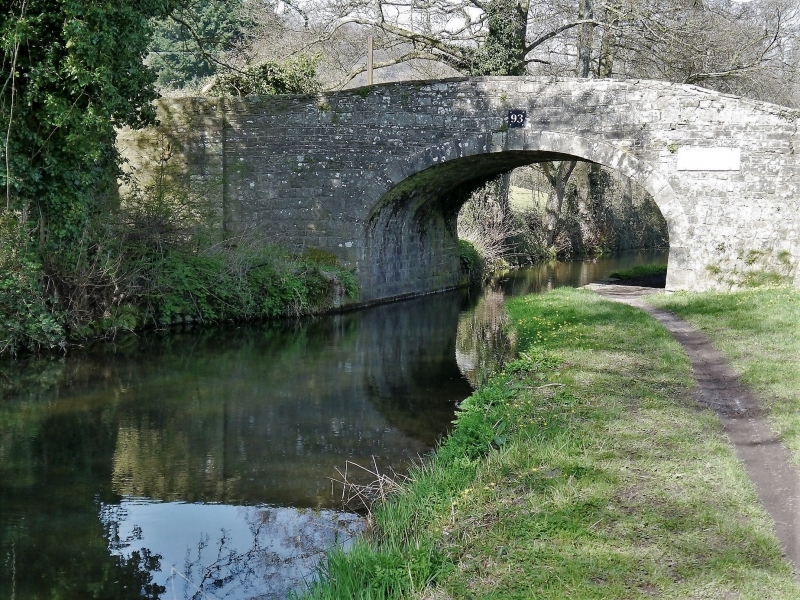 History: The Brecknock and Abergavenny Canal was promoted in 1792 to connect the upper Usk valley to the Monmouthshire Canal at Pontymoile and from there to the sea at Newport. Construction began in 1797, with Thomas Dadford as engineer, and the first section, from Gilwern to Llangynidr was completed in that year with the stretch as far as Brecon following in 1800. Work then stopped for a time with the result that the section to the Blaenavon Road east of Govilon was not completed until 1805, now with Thomas Cartwright as engineer. Further funds had to be raised and the last section from west of Llanfoist to Pontymoile was completed between 1809 and 1812, with William Crosley as engineer. Linked to tramroads, the canal was an important artery for trade in iron, lime and coal. In 1865 the Monmouthshire and the Brecknock and Abergavenny Canal Companies merged becoming the Monmouthshire and Brecon Canal Company. Later still the canal was bought out by the Great Western Railway and gradually the canal was run down until it was finally abandoned in 1962. Restoration work was begun in 1964. Description: This bridge (No 93) lies within the section constructed by William Crosley between 1809 and 1812. Depressed arch roughly coursed rubble canal bridge of standard design with voussoirs and swept out parapets with end pilasters. Cobbled deck; the lane beyond the bridge is now disused. At the north-east corner is the only surviving example on this stretch of the canal of a 1920 GWR notice displaying weight restrictions; it is lozenge-shaped and mounted on an iron post. A GWR boundary post also survives downhill from the bridge. Listed for its special interest as a surviving early C19 Brecknock and Abergavenny canal bridge with attached contemporary canal-side building. R A Stevens, Brecknock & Abergavenny and Monmouthshire Canals (Towpath Guide No 2), (Cambridge, 1974), p55. The bridge spans the canal 0.25km south of bridge No 94 and reached by a lane from B 4269. Tow-path to the east side. Situated 0.25km south-east of bridge No 94, midway between Llanfoist and Llanellen. Carries the canal around the hillside and over a stream that comes down from the Blorenge towards the Usk. Spanning the canal 0.25km south-east of Bridge No 95; tow-path to the east. Spanning the canal uphill from Llanellen village; carrying the hill lane from the north-west side of the village up towards Coed-y-Prior Common and Ffrwd Wood. Carrying the lane on a sharp bend uphill from the B4269 and towards Castell Prydydd and Coed-y-Prior. Tow-path to the east. Situated uphill from the village in a sloping churchyard with bier house to north-east corner. Spanning the River Usk on a bend in the main road, to the east of the village; on the Community Council area boundary.